Remarkable log book recording the China Station flaship HMS Glory during and after the Boxer Rebellion 1900 - 1902. Logbook for use of Junior Officers Afloat. C. V. L. N. / Log Book. Mr. C. V. L. Norcock / H.M.S. Hannibal Glory. An exceptional and important 1900 – 1902 British naval log book Penned by Charles Vernon Lowcay Norcock (1884- c. 1860), a Commander in the Royal Navy, recording the experience of the HMS Glory, flagship of the China Station, in the years of and immediately following the Boxer Rebellion. The full log book covers three ships, recording the voyages of the HMS Hannibal from May to November of 1900; Norcock's subsequent command on the HMS Glory, flagship of the China Station from October of 1900 to January of 1902; and his return voyage to England on the HMS Aurora, from January to February of 1902. 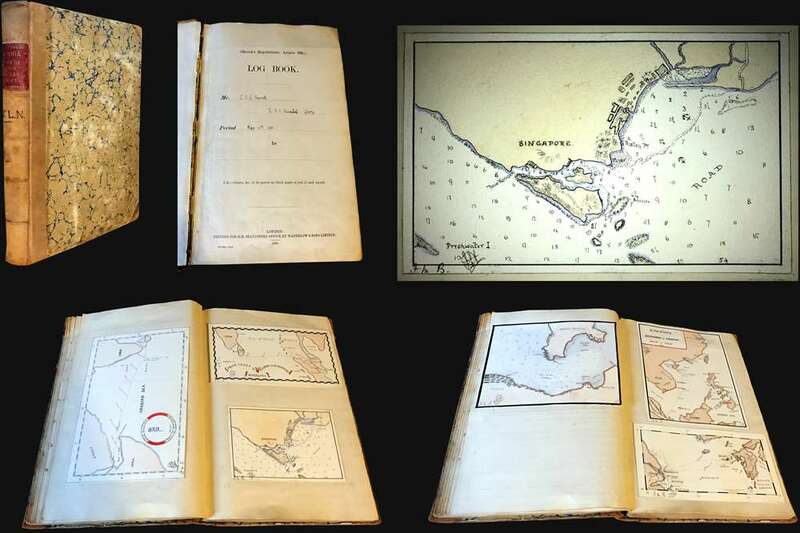 The content of this volume is exceptionally rich, surpassing most other logbooks we have seen, with numerous original manuscript maps of important East Asian ports including Hong Kong, Shanghai, Singapore, Kowloon, Nagasaki, Suez, Valetta, Wusong (Shanghai), Nagasaki, and more. The bulk of the logbook focuses on the HMS Glory, a Canopus class battleship commissioned in 1900 to be the flagship of the China Station. The 'China Station' refers to the British Royal Naval forces in East Asia and operated out of bases in Shanghai, Hong Kong, Wusong (Shanghai), and Wei Hei. It was active from 1865 – 1941 with the mission, often in cooperation with other international interests, to patrol Chinese coastlands and inland navigable river systems in order to keep the region stable for trade. The HMS Glory and Commander Norcock were active in China Station during the final stages of the Boxer Rebellion (1899 -1901), a violent proto-nationalist anti-imperialist uprising. Chinese nationalists of the Yihequan (Righteous and Harmonious Fists) Army embraced the belief that they were impervious to western weaponry. They assaulted the legations quarters in Beijing, Nanjing, and elsewhere in China, killing many foreigners and Chinese Christians. The Rebellion was rapidly and aggressively suppressed by the very effective foreign weapons wielded by an 8 nation alliance of western powers, consisting of Japan, Russia, the United Kingdom, France, Germany, Austria-Hungry, the United States, and Italy. At this time, the HMS Glory was primarily stationed in Wusong, a British naval station near Shanghai, where it provided a strong British naval presence at the mouth of the important Yangtze River trade artery. Norcock's log notes immense international naval activity in the region, much of it doubtless in response to the Boxers. He notes battleships flying the colors of the United States, Germany, Austria-Hungary, Italy, and Russia, among others. Much of this logbook's richness stems from its extensive and meticulously executed collection of original manuscript maps tabbed into the volume. All are signed by Norcock and many provide unique cartographic data, probably form Norcock's own ship soundings or copied from other manuscript material in the China Station collection. Some of the more interesting charts detail Singapore, Hong Kong (with details of the Central / Wan Chai), and the rarely mapped Tolo Harbor, Hong Kong. Singapore to England – with track of the Aurora. The logbook also records, in minute to minute detail, the HMS Glory's April 17th, 1901 collision with the HMS Centurion during a storm near Hong Kong. The Centurion drifted across her bows and despite evasive maneuvers by the Glory's captain, 'fouled Glory's starboard side.' While the Glory was largely undamaged, the Centurion suffered from a large hole. The logbook provides an image of the hole as well as notes on its repair. The logbook is a folio, half calf over marbled boards (rubbed), spine with contrasting red morocco, title label lettered in gilt and manuscript initials of the owner, C.V.L.N. ; marbled endpapers; manuscript in ink on feint-ruled paper. All in all, this is one of a kind of piece of great historical significance containing an assortment of unique manuscript maps of some of the world's most important ports during a particularly turbulent and dynamic period. A one in a lifetime discovery. Very Good. Folio, half calf over marbled boards (rubbed), spine with contrasting red morocco, title label lettered in gilt and manuscript initials of the owner, C.V.L.N. ; marbled endpapers; manuscript in ink on feint-ruled paper.